A wide variety of tissues derived from the three germ layers are seen in ovarian teratomas. Microscopically, the most commonly seen tissues are epidermis, skin adnexa, and neural tissues. Thyroid tissue is present in 10% of ovarian mature cystic teratomas. In this case, report, we present a rare case of papillary microcarcinoma derived in the ovarian teratoma and Hashimoto's thyroiditis with the normal level of serum thyroid hormones, which is normal but positive serum antithyroid peroxidase antibodies. Mature cystic teratomas constitute approximately 30% of benign ovarian tumors. They are also known as dermoid cysts because they are mostly cystic and skin, and skin appendages are the most common structures. Thyroid tissue is present in 10% of the all cases. Teratomas containing thyroid tissue are called struma ovarii. Although many diseases of thyroid tissue can be seen in ovarian teratomas, Hashimoto's thyroiditis is very rare and a few cases have been reported in the literature.,,,, Hashimoto's thyroiditis in an ovarian mature cystic teratoma and thyroid papillary carcinoma derived on this ground have previously been reported in literature with only one case, and our case is presented as the second case. A 61-year-old female patient with a history of abdominal pain for several months was found to have a cystic mass with echogenic areas of 58 mm × 54 mm on the right ovary. In the magnetic resonance images, a 6 cm × 5 cm mass was observed in the right adnexal area which is hyperintense on T1 and T2AG sequences, hypointense on fat suppression sequences and with contrast-enhanced nodal areas. The serum level of carbohydrate antigen-19.9 was high (302 U/ml) only the tumor markers. Serum thyroid stimulating hormone, free T3 and free T4 levels were normal and antithyroid peroxidase antibodies were found to be positive. In operation, 12 cm × 9 cm × 5 cm, a multilocular cystic mass was found on the right adnexa. The total abdominal hysterectomy + bilateral salpingo-oophorectomy procedure was performed after the notification that the intraoperative frozen section consultation was compatible with mature cystic teratoma. On the macroscopic examination, when the 12 cm × 9 cm × 5 cm dimensions cystic tissue sample was opened, a hairy sebum-like material was filling the lumen and 5 cm × 4 cm gelatinous area with a colloidal appearance was observed. In the microscopic examination, besides the typical findings of mature cystic teratoma Hashimoto's thyroiditis, nodular hyperplasia and thyroid tissue (struma ovarii) showing dense cystic degeneration were observed in sections prepared from colloidal area. Furthermore, a 1-cm diameter papillary microcarcinoma with nuclear features such as nuclear grooves, nuclear pseudoinclusions, and papillary structures with fibrovascular cores were observed in this background [Figure 1]a and [Figure 1]b. Around the tumor, there were intense lymphoplasmacytic inflammatory cell infiltration, diffuse cystic degeneration, lymphoid follicles with prominent with germinal centers, and prominent oncocitic change (Hurthle cell) in follicular epithelial cells [Figure 1]c. Apart from thyroid tissue, cyst wall with skin with adnexal structures, cartilage tissue, respiratory type epithelium, seromucous glands, and hair shafts were observed [Figure 1]d. The case reported as thyroid papillary microcarcinomas on the basis of chronic lymphocytic thyroiditis (Hashimoto's thyroiditis) developed within the cystic teratoma of the ovary. The whole-body scan was done with radioactive iodine and ultrasonography. No recurrence of the tumor was observed after the surgical procedure of the patient during the 2-year follow-up period with a 3-month interval. Mature teratomas contain various tissues derived from all the three germ cell layers. Thyroid tissue can be seen in 10% of the cases, but it is usually small in size and does not give clinical signs. Nodular hyperplasia, thyroiditis, and thyroid papillary carcinoma may be seen in the thyroid tissue. Nodular hyperplasia is usually seen in the thyroid tissue, and sometimes carcinomas and lymphomas can also be seen. The incidence of malignant transformation in all ovarian tumors is 1%–3%.,, The most common malignant tumor in mature cystic teratomas is squamous cell carcinoma, whereas papillary thyroid carcinoma arising from mature cystic teratoma is very rare. Struma ovarii is a monodermal teratoma with ovarian thyroid tissue. These tumors may cause hyperthyroidism by releasing thyroxine. Malignant struma ovarii usually occurs in the postmenopausal period. The definitive diagnosis can be made after histopathological examination of teratoma material. Patients are usually asymptomatic, but pelvic mass and pain are the most common symptoms. Clinically, hyperthyroidism is present in 5%–8% of these patients. Thyroiditis findings are rare in ovarian teratomas; furthermore, the Hashimoto's thyroiditis is extremely rare. Caruso et al. reviewed 305 cases of ovarian teratoma and found thyroid tissue in 20 (20%) cases and struma ovarii in only 2 (0.7%) cases. None of these cases have been mentioned about Hashimoto's disease. In a study of 315 ovarian teratomas, Watson reported 17 cases of thyroid tissue and only 1 case of Hashimoto's disease, in which antithyroid antibodies were found to be negative. Thyroid papillary carcinoma arising in ovarian teratoma which has Hashimoto's thyroiditis has been reported in literature only in one case. In this case, the patient had no clinical symptoms of thyroiditis, but Hashimato's disease was diagnosed because antithyroglobulin and antimicrosomal antigens were positive. As a result, lymphocytic infiltration of the thyroid tissue within the mature cystic teratomas may be seen, and this is a rare event that can be described as “ectopic Hashimoto's thyroiditis.” Since papillary thyroid carcinoma developing on the ground of Hashimoto's thyroiditis in mature cystic teratomas may be seen, this situation should be kept in mind, and careful microscopic examination should be done. 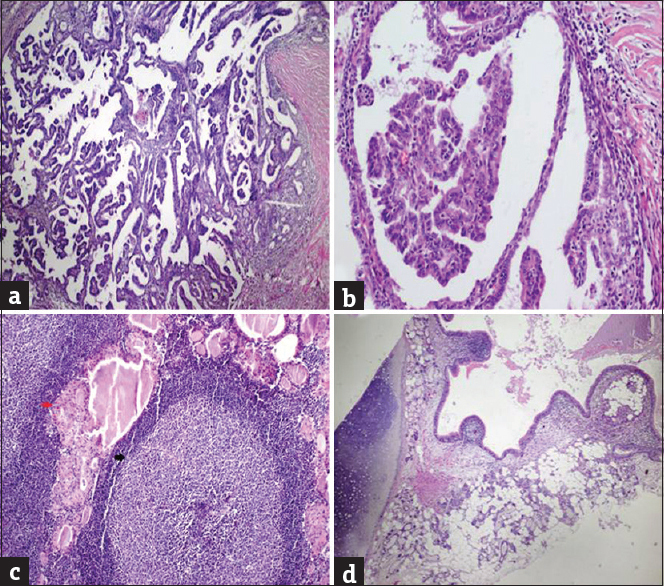 Kaur R, Singh J, Kaur A, Bansal R, Sharma S. Hashimoto's disease in a bilateral benign cystic ovarian teratoma: A case report. Turk Patoloji Derg 2011;27:261. Pantoja E, Noy MA, Axtmayer RW, Colon FE, Pelegrina I. Ovarian dermoids and their complications. Comprehensive historical review. Obstet Gynecol Surv 1975;30:1-20. Caruso PA, Marsh MR, Minkowitz S, Karten G. An intense clinicopathologic study of 305 teratomas of the ovary. Cancer 1971;27:343-8. Watson AA. Histological Hashimoto's disease in a benign cystic ovarian teratoma. J Clin Pathol 1972;25:240-2. Lupi I, Fessehatsion R, Manca A, Cossu-Rocca P, Martino E, Macchia E, et al. Hashimoto's thyroiditis in a benign cystic teratoma of the ovary: Case report and literature review. Gynecol Endocrinol 2012;28:39-42. Hasleton PS, Kelehan P, Whittaker JS, Burslem RW, Turner L. Benign and malignant struma ovarii. Arch Pathol Lab Med 1978;102:180-4. Kumar SS, Rema P, Anila KR, Varghese BT. Thyroid type papillary carcinoma arising in a mature teratoma. Indian J Surg Oncol 2014;5:168-70. Iwahashi N, Deguchi Y, Horiuchi Y, Noguchi T, Yahata T, Ota N, et al. Live birth following laparoscopic fertility-sparing surgery for papillary thyroid carcinoma arising from mature ovarian cystic teratoma: A case report. Mol Clin Oncol 2018;9:613-6. Makani S, Kim W, Gaba AR. Struma ovarii with a focus of papillary thyroid cancer: A case report and review of the literature. Gynecol Oncol 2004;94:835-9. Bonadio AG: Hashimoto's thyroiditis in “struma ovarii”. Case report and review of the literature. Minerva Endocrinol 2002;27:49-52. Doldi N, Taccagni GL, Bassan M, Frigerio L, Mangili G, Jansen AM, et al. Hashimoto's disease in a papillary carcinoma of the thyroid originating in a teratoma of the ovary (malignant struma ovarii). Gynecol Endocrinol 1998;12:41-2.